Our new AV-Playback V2 far exceeds its comparably priced competition in capability, flexibility and in performance. Offering a full list of robust operational features any professional playback operator will find indispensable, and now with support for building multi-layered presentations on the fly, produces and directors will appreciate you for having it as well. Multiple High-Performance Video Engines: AV-Playback incorporates the latest and most advanced video rendering technology capable of supporting up to 230 different file types. Each media element in a playlist is given its own independent rendering graph, affording their own wide range of customizable settings and then places them into an infinitely layered pixel space. This architecture enables each to be played individually or in combination with other media elements simultaneously. Custom Pixel Spaces: By default, the program pixel space conforms directly with the dimensions of the assigned output display, but you can also choose to extend that space and span across multiple displays. This is accomplished internally and does not require any other outboard devices. All you need to have is a multi-output graphics GPU as part of your computer. Multiple Layers: Each base element (single entry in the playlist) can have up to four additional transparent layers overlaying it. These layers can be either a video clip, still graphic image or live image capture. Each layer can be easily resized and configured to appear anywhere within the overall pixel space and at any varying level of opacity. They also have all the same property settings as a base clip. Isolated Threading: When AV-Playback is fully operating, dozens of individual operational threads are established. To ensure uninterrupted playout of video files all the while an operator is needing to interact with other program functions, AVP employs innovative techniques to effectively isolate each thread from one another and minimize the threat of any glitching. Four Individual element (3 – Video & 1 – PNG) spanned across two 1080p outputs. Click to learn how to add layers. Three in sync layers spanned across four 1080p outputs. Click to learn how to span outputs. 1) Dual Mode Playlist: From this robust control window you can organize and configure your entire playlist. All pertinent info regarding each media element is outlined and many can be directly edited by typing in values. Instruct clips to either link with one another and/ or have individual media loop on itself or repeat an entire cluster of linked media. You can even set a maximum number of repeats so when the limit is reached, the control will either stop and return home or pause at the punch out point. Adjust the clips audio gain as well as individually assign it to a separate audio output. Access the elements properties page. Access a base element’s individual laying data grid. This where layer elements can be added and configured. If you prefer not to have to work in a list, you can click a button and instead of a list you can view and access all playlist elements by way of large easy to see thumbnails. While in this view you still have access to all of the media elements properties and settings including any added layers. 2) Timeline: This provides you with an interactive graphical representation of the base element as well as its associated layer elements. Here you can easily make adjustments to an element’s punch in and out points, set the starting point for when a layer will appear on screen, and in the case of using a video clip as an additional layer, and you wish it to loop for a set amount of time, simply set the element to loop and then drag the right edge of the elements icon out to the time point in which you would like it to end. This area also contains quick access for setting in and out points instantly jumping to either of those points, engaging rapid rewind and a speed adjustable fast forward, all with a simple click of a button. Another useful tool provided by the timeline are insertable Tag markers. You can insert as many as you like and can be easily dragged any point within the timeline. Once placed you can opt to view running countdown times between each marker. You can even right click on each of them and add note text which will automatically pop up when the hovering the cursor above them. 4) Program Control Section: The controls in this section provides everything you need to handle program activity. Element Settings Window: This window provides a whole host of user-controlled adjustments for any base media or layer element. The settings are organized into five separate categories. 1) Geometry: X & Y position, X & Y scale, Independent 4-sided clipping (which scales with the fill size), Convenient buttons to snap an element to different locations within the pixel space. 4) Proc: Opacity, Brightness, Contrast, Chroma, Hue, Gamma offset(all) and separate gamma levels for red, green and blue. 5) Key: Trigger color can be adjusted using the red, green and blue adjustment controls and tolerance to fine tune the cut. 6) Properties: Provides direct access to the individual property pages for each filter contained the clips render graph. You can also save settings as a treatment to recall them later and apply them to other media elements. Confidence Monitor: Each playlist unit will feature its own confidence monitor array. The array is comprised of one preview and one program display. Each has its own set of on-screen data points. At the top is displayed the title of the current clip. These titles are in line with the media that is currently active in their respective slots. The same rule applies to the pair of position displays (Elapsed / Countdown) and current transport status icon at the bottom of each screen. To the left are the VU meter displays. The default is two channels but will automatically expand when more tracks are employed. As with the Playlist Unit the monitor’s location and size are automatically saved to its respective playlist file. Convenient Launch Control:Every time AV-Playback begins, the first thing you will encounter is a convenient ‘Launch Control’ window. This gives you immediate access to important tools that will get you up and running quickly. AV-Sync Hub: With this powerful relay tool you can us to synchronize additional networked workstations with broadcasted control commands from a designated primary workstation. To ensure synchronization is as tight as possible the hub performs two critical functions. One is, each workstation receives a parodic time stamps which it then in turn uses it to continually jam sync its own internal clock, and the other is to constantly measure for any network latency directly affecting an individual workstation. It then uses this data to carefully time the delivery of the respective command packet to that workstation. External Control: The hub can also be used to receive external commands from our MCS5 control surface as well as strings from third-party devices. Now you have a single access point were these external commands can be then distributed globally throughout the network as well as current position data of any clip that is being played out to program on that workstation. AVP Timecode Display: This convenient executable can be easily copied onto any computer, without the need for any invasive installation or license. The application, when active on a computer that is currently connected to the same AV-Playback network, will display position data from any enabled AVP node. This position data reflects the current running time of whatever is playing out to program. The individual viewer can select from any AVP workstation currently broadcasting as well as having a choice of seeing either elapsed running time or its countdown equivalent. You are also able to set it to calculate the time shown based on the clips total native duration or the trimmed duration between punch in or out points. File Conversion Utility: Another key feature is the convenient file conversion utility. Using this control, you can easily convert any video or music file to a format that may better suites you need. New for V2: We added the ability to alter the converted elements resolution as well its frame rate.. 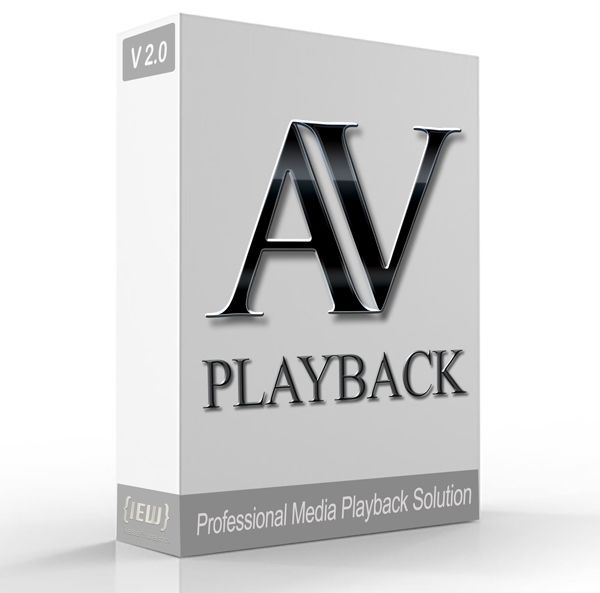 Try AV-Playback V2 for yourself and see first hand how it can work for you! Very Important Notice Regarding Windows 10, Please Read! It is very important that all AV-Playback users running with on Win 10 perform all current windows updates, especially the March features update. I have found that versions prior to that have begun exhibiting very poor and glitchy performance. It is also important that if your systems incorporate Nvidia GPU’s you ensure those drivers are updated as well. No, I don’t believe this has really anything to do with AVP per say since it has and is still on .NET version 4.6.2 for quite some time and these performance issues have seemingly just popped up. Instead I think Windows machines are beginning to behave more and more like Apple products do, in that if you don’t perform regular updates, operation within the computer begin to slow down. I know most of you try at all cost to keep your rigs off the internet but trust me you are going to want to perform these recent updates. Remember that If the computer hasn’t been updated in a while Windows will need to first download and install several patches before it will even discover the features update. So first get all the ancillary ones installed then come back to the check for updates and let it do the features update. 1) Made important improvements to functions related to the optional media pre-buffering. It was observed that when pre-buffering is enabled and a playlist is closed with clips set to buffer, then when we opened those files with the buffer property set were not loading correctly. This would lead to unstable behavior and potential shutdown of the program engine. 2) Corrected issue that was causing improper loading of media files when added to playlist by dragging and dropping from Windows explorer. 3) Corrected problem that when the user changed the default program audio device clips already in the playlist where not being effected, instead they would still be directed to the device that was set when the clips were originally added to the list. 4) Changed default for “Use Pre-buffering” to false. This means that for new users the system will not automatically employ playlist pre-buffering. As with anytime time this option is disabled, the system will only load media once it has been selected for standby/preview and removed from memory when another file in turn has been selected. This older A-B method does produce a longer wait time between the selection of clip and it readiness for program play but is safer, more stable and will prevent the inadvertent overload of computer resources. Added a filter that removes the extra trailing whitespace that the current version (1.2+) of Companion adds to the command strings it transmits while setup to control AV-Playback. This now allows it to correctly control each version of AVP. Considering this feature being added to the V2 edition I felt this would be beneficial to have in L1 as well. When using the "Using Prebuffering" method in L1 you con now individually select out of an entire playlist, to buffer only the ones that are needed during a particular session. This feature allows users to set prebuffering of playlist elements individually, making it possible to better manage the total amount of system memory utilized at any one time on a given computer. So, if managed properly you can maintain a very large number (e.g. 20, 30, 50+) of playlist items but only buffer enough of the elements that are needed for immediate use. Since so many users opt to employ laptop computers, and despite what people may think, laptops have considerable performance limits compared to full size desktops, and generally equipped with a smaller amount of memory, this being the chief concern. To ensure the ability to instantly call up and play a video file, they first need to be opened and sitting in RAM memory. Now in the real world of tight budgets and events that require a lot of video rolls, combined with a lack of communication as to the sequence in which files are to be played, forces operators to just throw all of them into one playlist and then get organized on the fly. Fine but if the app wants to just dump all of them into RAM, most computers and especially laptops will not be able to accommodate them all. Therefore, it is better to be able to select only the ones you need for a particular session. In V2 and in L1 (if “Use Prebuffering” is selected,) by default when adding media, file data will be entered into the playlist but will not be loaded for immediate play [, buffered.] So after they are added to the playlist you then need to determine which are necessary now. Once that is determined go ahead and click on the [, in L1 the “Buffer” icon located at the top left of each thumbnail. For V2, check the “Load” option on each playlist row.] This will load that clip into memory making it instantly accessible. You can, however, click directly on an unloaded clip and will first be loaded before being placed into preview. Although this does take a bit of time, and if this is attempted while another clip is playing in program a message prompt alerting to the fact that it will cause glitching in the program playout if you continue will appear. The nice part is you can, at anytime, remove a clip from memory by simply unchecking the option. You also can do this as often as you like without needing to restart the app. Sorry guys but there has been a needed revision to the last update. I discovered some anomalies that prompted me to perform some additional tweeks. If you had installed version 2.3.1.1 please go ahead and do it again. I am excited about all the new features that have been added to AV-Playback V2! 1) Added feature that allows users to set prebuffering of playlist elements individually. This will make it possible to better manage the total amount of system memory utilized at any one moment. This also means you can maintain a very large number of playlist items without over exceeding your computer's resources. This is done by only buffering enough of the elements that are needed for immediate use. You can unload any element individually at any time. 2) Added the ability to use any .rtf text document as a media element. Overall document background will remain transparent; however, you can still set a font back color. 3) Can use any text editor that can export .rtf type files. or you can use a new built-in text editor for creating and/or editing .rtf documents directly within AVP. 3 ) Improved chroma key pixels shader algorithm with adjustable edge softening. 4) Added the ability to set any playlist media element as a static background that while enabled will always remain visible on the lowest layer. Example use could be when the background element is a live SDI input you can use the rest of the playlist to serve out lower third files that can be keyed over it. 5) Added a specialized black key function that quickly removes any pure black pixels leaving them transparent. 6) Added interactive color picker for selecting the chroma key color. This includes a method which you pick a color displayed anywhere on the screen by just moving your mouse cursor over it. 7) Added a drop shadow effect that can be applied to any visual type media element. 9) Improved how popup error and/or message prompts are displayed. Now instead of appearing as a floating dialog box that sometimes can get trapped behind another window, they are now contained directly within their respective control window with a protective semi-transparent shield that prevents any further mouse clicks on that control (,subsequently changing topmost status and causing the prompt to become trapped behind,) until the message has been acknowledged. As you can see, I do not rest and will always be working to improve features and usability of all our products. Like our new E1 version both V2 and L1 can now be licensed using our online activation server. This means that if you do not wish to deal with USB dongle keys you can now order copies without the extra expense associated with having them as well as any associated shipping charges. This is especially helpful for overseas clients who would otherwise have to pay additional VAT taxes as well. Another benefit is you can activate the software immediately after purchase, no more waiting for dongles to be shipped. If you are thinking… “What if I need to move the license to another computer?” Well, if you have access to the activation code received upon purchase and an internet connection you can easily transfer the license yourself. In all three editions (current updates required), under the app’s Help menu there is now a “Transfer License” feature. All you need to do after clicking is to paste in your activation code, click “Deactivate” and then on your new computer, when asked to enter an activation code, go ahead paste in your code there and click “Activate”. That’s all you need to do. Once done you can remove any internet connection and use the license for as long as you want. So, the important thing is to always keep your activation code in a safe place. If you must have dongles for inventory control or any other reason you can still order them (V2 and L1 only) as an option during purchase for an additional charge plus shipping. On another note, the new update for E1 (v1.1.3.1) now includes a completed help file system. The other version also have updated help files which includes a step by step tutorial on transferring the license. Sorry guys yes there is a new AVP update... This time though it is only for L1. I had some time to revisit the use of L1 without pre-buffering the playlist so I got to work. To refresh your memory a user can opt to not preload all media items in a playlist by unchecking the Pre-Buffer Media menu item. The reason to not pre-buffer is to prevent the app from possibly trying to allocate more ram memory then is available on a given computer. The downside to this is that the response time between clicking to select a clip and when you can actually start playing it grows considerably due to the time it takes to open the file only on demand. This gap gets larger as the physical size of the file gets larger. To counteract this all AV-Playback products will by default pre-load all playlist media. This will then allow you to instantly jump from one video to another with no lag. However, if the playlist gets too large for the amount of memory available then overall performance suffers greatly. This is why your computer should be outfitted with at least 16gb of memory (prefer 32). At any rate if yours doesn’t but still need to have many dozens of video files loaded into a single playlist you will probably need to disable the pre-buffering. This brings me back to why I wanted to revisit and see what improvements I can make when not prebuffering. One that was observed and wanted to correct right away was the fact that clips would not start automatically when the Auto Start feature was enabled. This turned out to be a timing issue because of the lag after selecting a clip. The rest was to reconfigure the point in time during the mouse click did the actual buffering of a clip occur. All and all I feel that all the tweeks performed has greatly enhanced response times as well overall usability. Enjoy, and as usual, have a great show! I am pleased to announce that ifelseWare, Inc. has officially thrown its hat into the turnkey ruggedized PC arena with the release of the new LMS1 Legion media server. The LMS1 boasts a total height of only 1.3 rack space units. It may be small but the LMS1 still offers some very impressive specifications making it one of the slimmest multi-destination media server on the market today that can still withstand the rigors of the road. The benefit of such a compact design is not only convenience but coincidentally makes it much more rugged. In order to fit all the components in such a small space, we had utilized more embedded peripherals such as M.2 SSD’s as well the optional Decklink SDI capture card that is also in M.2 form factor. Both of which are securely screwed directly to the motherboard. The only peripheral not attached directly to the motherboard is the NVIDIA graphics card. It instead it is mounted horizontally and securely bolted directly to the chassis at both ends. Even the bus connection to the motherboard is facilitated via a high-density ribbon cable, no rigid mechanical connection. Combined, this design prevents any mechanical stresses from being transferred due to the weight of the graphics card being vibrated while in transit. No more needing to re-seat cards every time arrive at a new show site. With the ever-increasing demand for higher and higher resolutions as well more destination outputs, today's playout solutions need to be outfitted with the latest and most powerful computing components available. So for our introductory base model, we didn't cut any corners. In fact, many of the assorted components used are the manufacturer's flagship top of the line designs. We started with the Z299 Designare which is Gigabyte’s premier socket 2066 motherboard. Next, we added Intel’s newest Core i9 series CPU the 7900X features 10 cores that can handle up to 20 threads at the same time. To keep this beast cool, LMS1 utilizes a unique low profile liquid cooling system. Feeding the data stream is a 1Tb Samsung 960 EVO M.e SSD drive, which is then buffered with 48Gb (upgradable to 64Gb) of Corsair Quad DDR4 RAM memory. Final display output is generated by an NVIDIA 8Gb Quadro P-4000, the most powerful single slot professional graphics card available capable of rendering combined pixel space of over 50 megapixels. I need to first apologize to all our friends in France and ones in other countries where their written language includes diacritic characters (accent glyphs) in its alphabet. When first developing AV-Playback I admit I was happily working away within my English-speaking bubble. Not really considering how the syntax of other languages might not be fully compatible with some functions contained internally within the program. Namely, ones that are used to convert text strings to a byte stream and back again. This conversion is necessary for communications between other portions of the program. The problem however, was with the encoding standard I was employing. By default in the Microsoft version of the “C” language anytime you employ a byte stream reader or writer the basic 7 bit ASCII table is used which does not recognize diacritic characters at all. So when let’s say, a clips file name includes this type of character and then converted those characters are replaced literally with a “?”. Now when AVP attempts to open that file it has the wrong spelling and would fail with a file not found. The problem, of course, is not a new one, hence why back in 1988 a bunch of people much smarter then I started the Unicode project in hopes of creating a single character set encoding standard that could support all of the world’s scripts. However, like I said, I live primarily in the English language bubble so this potential problem never crossed my mind. My thanks go out to Romain who is with an A/V group in Paris and was the one that brought this issue to my attention. I have since changed the encoding to the Unicode standard in all three AVP editions. While in there I also patched a couple of other minor issues that also were discovered so everyone should go ahead and perform updates on all your copies. Corrected indexing issue found when using the MCS5 control surface with multiple playlists on the same computer. Modified the “Clear” and “Mute” keyboard shortcuts to now require the ALT to pressed along the letter “C” and/or “M” respectfully. Made further improvements to function related to in-sync backup operations. These improvements greatly increase stability and reduce the chances for the potential loss of communication between workstations. Corrected issue that prevented the loop iteration number from counting upward while looping an entire array of linked clips. Made considerable improvement to the link and loop delay function. As well as ensuring the time point at which the automated hold (freeze) does not occur until reaching the punch out point regardless of whether or not the fade to black is activated. Corrected issue preventing preview transport buttons from becoming enabled once a clip has been selected and nothing is playing in program. Made further stability improvements for the operation of an in-sync backup configuration. Corrected problem that was preventing the backup start delay value from being set correctly. Added the ability to now allow multiple instances of the program to be launched and run at the same time on the same computer. If you are currently using any of these versions please be sure and update your copies. I want to thank all users for embracing AV-Playback and have a great show! Any newcomers please go to www.ifelseware.com/AV-Playback to learn more about all of the products we offer. We are pleased to announce the release of our newest and least expensive AV-Playback version yet! E1 is the newest addition to the AV-Playback product line. Let’s start with the best part, its price, $124.00 per license. As Promised though E1 is still an application designed for professional use, providing features like clip linking, looping with the ability to set the maximum number of iterations, auto freeze, as well as the ability to save user notes. In order to offer such an inexpensive, playout solution, some sacrifices did have to be made, such as having an independent preview engine, multiple layers, or any sort of crossfading transitions. However, this streamlining did enable us to create an extremely reliable GDI based video engine that will not suffer from possible system compatibility issues sometimes associated with DirectX based graphic renderers. It is also incredibly efficient in its use of available system resources enabling you to still playback very high-resolution videos smoothly on even lower cost and less powerful laptops. This is accomplished by use of an innovative media prebuffering design that can be configured based on your systems capabilities. The default option is to pre-buffer ahead of time all media elements contained in the playlist. This provides the highest level of agility and smoothness of playback when needing to aggressively make rapid selections all while media is playing. However, the price paid for that agility is much more ram memory is absorbed meaning your computer needs to be well equipped with at least 8 to 16GB of RAM. For systems that are not as well equipped, you can opt to not pre-buffer. In this setting, each clip is only loaded when selected dramatically reducing the amount of system memory needed hold all the media open. Although there is a downside to this, in that it requires more time between selections to load media into memory. It is only recommended that option only is utilized if only occasional playing of media files and there is ample time in between to set for your next cue. In-Sync Backup: E1 offers the easiest setup of a backup unit yet. Just have both computers share the same network assign one as the primary and other as the backup. Open each, click on one button, and now anything performed on the primary will be mimicked on the backup as well. This includes even the automatic transfer of media files from one machine to the other. Remote Command Listener: Open its UDP packet listener and E1 conforms perfectly with our AVP Connectionless Protocol enabling operation via any third-party device that can transmit custom ethernet command strings. HyperDeck Emulation: Following in tradition of its bigger brothers E1 can connect seamlessly with any Blackmagic ATEM switcher. When on the same network as the ATEM, you can than go into the switcher’s HyperDeck control panel, assign AVP’s IP address and the switcher will see it as if it were another available HyperDeck. Now you can take advantage of the switcher’s auto play feature This feature automatically instructs AVP to play anytime the assigned input is selected. I corrected an issue that was preventing H,264 file types from being added to a playlist. The error was a result of a minor function that tries to retrieve the files bitrate. The problem with H.264 is that it has a variable bitrate and when quarrying for that information the value returned is a floating range and it format was incompatible with the standard parsing function inside AVP and would result in an error. There however are ways to query for a maximum range value which gives a single integer value. By the way this is always zero for the majority other file types hence why it is not the best way to get the answer universally. This patch extends the query function to compensate and to also prevent any further errors. The funny thing is the original function has been in the code for years and this is the fist time it has been brought to my attention. Just goes to show how rarely that file type is used. I have just published a set of important updates for both V2 and L1. Both focus primarily on improving accuracy and stability of all functions related to the linking and looping of playlist elements. It was observed that there were some issues with V2 playing a playlist of clips each with their own in-sync layer. Playlist items where all linked together and the last one directed AVP to loop back to the first clip pair and re-run the sequence… At first, everything seemed fine but let's just say 20 minutes later of repeated play, the sequence would just come to a stop. No error it was just like the user clicked on the End button. The thing was the sequence really needed to continue on for many more hours. So upon deeper investigation, it was found that randomly the playlist would receive an end of file signal from the program engine. Not good. This prompted me to dive deep to find out why this was happening. I found it and that made me look even deeper at other aspects of the linking and looping. This update provides a solution to all of it. It even got me to improve the accuracy of just when a clip reiterates in a loop even if it as the crossfade flag set. Since much of L1 shares the same code, I needed to do all of the updates to it as well. Well that was just the beginning. Another user found out through some tests the fact AVP uses port 7000 for the AVP control protocol, and that same port number was also being used by Watchout, if the two were being used at the same time there would be a serious conflict. This prompted me to rework the interface of both apps to provide users a way to set a custom port number instead. But wait there's more! The ugly Windows display scaling feature reared its ugly head again. This time causing the preview and program confidence monitors to not be positioned correctly in L1 if the primary display had a scale greater than 100%. That has been addressed as well. I rounded things out by also improving the positioning of the preview and program confidence rendering surfaces so they will not obscure view of the time and Audio VU displays. All told this has been a very busy week for me but the fact that these updates will make for a more successful event… That is all the reward I need. We have just released the L1 version of AV-Playback! AV-Playback L1 has many of the same great features found in V2 at a much lower cost. We engineered for your more average sized events and with an almost non-existent learning curve it will get you up and running right away. For L1 we took a different approach… Everything needed for operation is divided into three major control sections, all of which are contained in one window. We also opted for a more tactical look and feel. Instead of using a plain data table list as in earlier versions, all playlist elements appear as large thumbnails. This provides you with a higher level of confidence that even under stress, you will make the right selection. Each thumbnail panel provides not only a large selection zone to click on but also contains quick action toggle buttons to important options like Fade, Link, Loop, Hold, Info and Remove. All property settings for each media element is contained in one easy to access panel. The Preview and program control sections each contain their own fully independent transport controls as well as large viewing monitors. Each also contains their own graphical timeline tools enabling you to easily perform trim edits on the fly, even while media is playing. L1 offers the easiest setup of a backup unit yet. Just have both computers share the same network assign one as the primary and other as the backup. Open each, click on one button, and now anything performed on the primary will be mimicked on the backup as well. This includes even the automatic transfer of media files from one machine to the other. L1 Beats the competition by being to only one under $300.00 to offer true crossfading between clips. L1 supports two different operating modes: Considering the wide range of varying capabilities a users computer might be equipped with, L1 provides two different ways to manage how the app utilizes system memory. The default option is to pre-buffer ahead of time all media elements contained in the playlist. This provides the highest level of agility and smoothness of playback when needing to aggressively make rapid selections all while media is playing. However, the price paid for that agility is much more of ram memory is absorbed meaning your computer needs to be well equipped with at least 8 to 16GB of RAM. For systems that are not as well equipped, you can opt to not pre-buffer. In this situation, each clip is only loaded when selected. This dramatically reduces the amount of system memory needed. Although there is a downside to this, in that it requires more time between selections to load media into memory and this act can also produce small tremors within the CPU threads resulting in possible glitching of any currently running media. It is recommended that this option only be utilized if you are playing media files occasionaly and there is ample time in between to set for your next cue. Pricing is $299.00 for one license and $538.00 for two. NOTE: All current AV-Playback V1 and V2 license dongles will unlock L1 as well That also applies to any future V2 key purchase as well. So buying V2 licences gets you both programs. Important new update for all international users. I recently had a user in Germany complain that AV-Playback V2 was working very poorly on his computer. He assured me that the system met our minimum standards but AVP would still take forever to completely perform a fade in or out, that’s if he could ever get the clip to actually stop on command, most times the app would just crash. Needless to say, I was very concerned and definitely wanted to get to the bottom of the issue. It was then that it dawned on me that if the cultural region set within Windows was German, Windows would then automatically change how numbers, dates and time are handled. Case in point, the German language does not use a period to designate the decimal point in a floating integer. It instead uses a comma. The problem is AV-Playback uses commas extensively as a way to delimit the parsing of command character strings. So when the string would contain a typed version of a floating number the fact that it now has another comma in it would mean that when the combined string was parsed there would be more separated groups then what the receiving function is expecting hence the making of a major catastrophe ending in a possible crash. If you are currently running AV-Playback on a laptop that includes a discrete NVIDIA GPU to supplement the motherboards embedded GPU solution, you may have seen “Run with graphics processor” in the popup menu when right clicking on a program executable or shortcut. Since the use of the NVIDIA GPU can quickly lower your laptop’s battery life, most manufacturers will opt to use the embedded Intel GPU as a default. This is why NVIDIA created Optimus. Its job is to determine which app would be better served if run through the high-performance GPU instead. The problem is it doesn’t always get it right especially if the laptop bios overrides its decisions because you are not plugged into AC power. AV-Playback V2 is very GPU intensive and in most cases, performance will suffer if rendering is not handled by the discrete processor. It is also very important to understand that AV-Playback is made up of three separate executable programs (Main GUI interface, program video engine, and the preview video engine.) It’s the video engines that perform all file streaming and rendering and it is those that need the extra GPU support. If you try to just select “Run with graphics processor” when launching AVP the only thing that will be given a boost is AVP’s desktop GUI and playlist control window. This will do nothing to improve video playback performance. 1) Launch the Nvidia control panel. The easiest way is to right-click anywhere on the Windows desktop and select “NVIDIA Control Panel”. 2) Once it is launched select “Manage 3D Settings” link in the left-hand column. 3) Select the “Program Settings” tab. 4) Now you are going to need to click on the add button and search the list to find “AVPProgramEngine” and “AVPPreviewEngine”. You will need to add each one separately, so first select the program engine and then click “Add Selected Program”. 5) Select “High-performance NVIDIA processor” in the Preferred graphics processor list. 6) Now you can go back and do the same steps for the preview engine. Once both are done simply click “Apply” and then close the control panel. This is it…a completed version! I say completed because now that the help file system is fully built I am finally able to check off the last item on the original to do list. Aside from the inevitable bug patch here and there I do have a new list of to-dos’ I want to start working on…One is the integration of the new MCS6 control surface. This controller is so sweet! You are especially going to love its clean and ergonomic design and supper nice jog and true shuttle wheel. Add full character text generation with ticker tape scroll ability. Improve the warping capability. I want to take it from 8 points to a design where you can create an infinite number of points anywhere within the frame that can move in any direction. Improve the chroma key pixel shader and add a luminance key to better deal with dithers and fades. Further down the road I will give the timeline its own clock and more tracks which will include separate audio tracks. Just posted an important update! As I write tutorials I will occasionally retry the steps using the current version. Well while doing steps related to explaining how to add layers I discovered a few concerns. mostly with the adding of a layer file then deleting it and the then turning around and re-adding it again. Regrettably this had unforeseen consequences. I thought to myself where there is one I'm sure others will follow. Low and behold I found them! This update corrects them plus a few others I already had on my hit list. The corrections are especially helpful to individuals who are hunting and pecking around aimlessly clicking on buttons in the attempt to figuring out how to use the app.